If you love to listen to music while in your car, you most likely have a large CD selection (if you don't all have it on an iPod now, or something like that). Instead of having to lean over to reach CDs in awkward places in your car, just keep them all in this visor organized designed to hold CDs. The product that is featured holds up to 20 CDs, and is held onto the visor with elastic straps. These straps fit most visors, but some large cars with large visors may be too big for it, so keep that in mind. 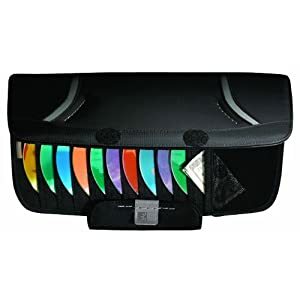 In addition to using this organizer on your visor, it is also handy to put in your glove compartment or in the door side pocket of your car.